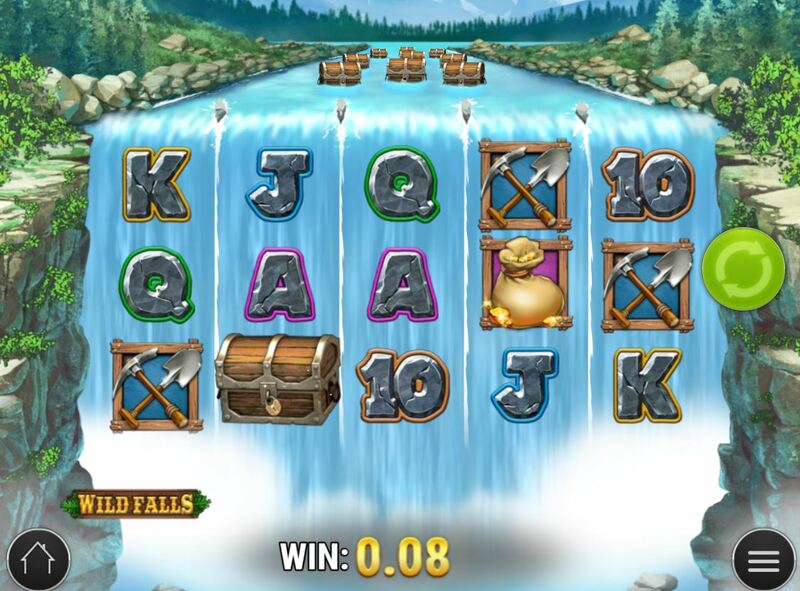 Wild Falls slot takes us for another visit to the Rocky Mountains as did Play'n Go's classic Wild North game not too long back and Buffalo Rising recently. This game isn't focused on wildlife though but more the world of the gold prospector with remote forest and a river in the background and transparent reels which are necessary for us to see the waterfall behind them. The waterfall has more than a little significance as we'll soon find out, even though we hear twangy country guitar music as opposed to water crashing down as we play. So will Wild Falls help us pan for gold, or will it be our bankroll that's panned here? We begin on Wild Falls with 20 pay lines over 5 reels of 3 rows and no Wilds or scatters anywhere, but don't worry, like the gold nuggets in this region a little work is necessary to uncover them. For now we have single symbols and the 5-of-a-kind pays are quite decent with 25x for Gold Bags, 20x Pan, 15x Shovel and Pick, 10x Lamp with 5 card values at 6, 5, 4, 3, and 2x respectively. So how do we dig up those elusive Wilds in this landscape? If you check the river our just before it turns to a waterfall behind the reels you'll see numerous wooden chests floating dangerously close to the edge. Now these are both Wilds and scatters and you'll see 4 conveniently placed rocks on the edge of the fall which means they can only be channeled to go over the fall onto reels 2,3 and 4. Now sometimes they'll just simply disappear in the torrent but on some occasions they land over a symbol on that reel. If this occurs, you get paid any win and then the Wild Chest sticks in place and you get Rapid Respins. If another Wild Chest lands, then you get a second respin during which you hope the third one lands as this will trigger unlimited free games! The unlimited free spins commence with the triggering 3 Wild chests in place and these will drop down one row each spin so it will be over very quickly unless more Wild chests end up on the reels in the first 2 spins. The river has turned gold in colour now so fear not, they usually do and you'll be very unlucky to get 5 or less free games. You may end up with 2 or even 3 Wild chests on one reel at once. Once all the chests have vanished, the bonus ends. The rewards aren't great here and you find the result in invariably between 10 and 30x bet. Surely we can see better than this??? Now you may notice when you're playing that randomly the Wild chests on the river turn gold. This means that when they land on the reels a 2x, 3x or 5x multiplier is randomly awarded to them. If one does land, you are guaranteed that the Wild chests on the river will remain gold until the respins end. If you manage to trigger the bonus with 3 Gold Wild chests it works exactly the same as described above, only you now have the potential for a 2 to 125x multiplier on any Wild wins! Play'n Go proudly tell us on the intro screen that we can win up to 10,000x bet in this bonus! 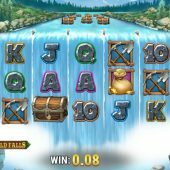 Wild Falls is an imaginative game via the clever use of the graphics and incorporation of them into the background theme. This is also its main disadvantage as I found the chests bobbing above the reels very distracting and kept having to divert my eyes above from the grid. If you can overlook or tolerate that, the game is quite good in appearance, graphics and animations although the twangy country banjo gets irritating quickly.